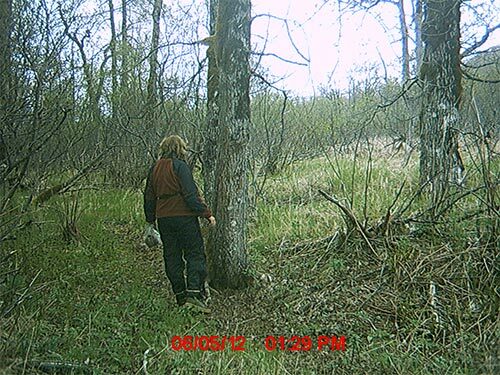 In this first set of pictures the camera is placed in view of a rub tree popular with bears. In the first image, Robin is looking for bear hair in the sap and snagged on the bark. She is about 5' 9", which provides a good perspective for the images that follow. Robin Overall has lived in Kodiak for more than 30 years and has been an avid camera “trapper” for five years. She places her trail cameras on established bear trails, in view of rub trees, and near streams. She provided an amazing assortment of images, many featuring the famed Kodiak brown bears.